Margaret Archibald recalls some highlights of her day at Rutherford School where she and harpist Alexander Thomas were contributing music workshops designed to explore this year’s summer club theme of “Water”. It really is astonishing how much stuff I manage to take for one day of workshops! It was 1st August, there was no school-run traffic, and I arrived at Rutherford School with more than an hour and a half to spare to set up for a full day of workshops with harpist Alexander Thomas. This was already the second week of the school’s Summer Club, and we would spend the day working with five different groups of children all with profound and multiple learning difficulties. Somehow the time flew by as I unpacked lots of small percussion suitable for the school’s holiday project “water”, raided the music therapy percussion trolley, created a watery décor with water-blue silks and colourful umbrellas, and laid out the props and percussion ready in appropriate batches to be used for successive music items. Alexander Thomas arrived early too, having allowed plenty of time to drive from Dalston with his harp, the very special instrument chosen to be a new experience for the children. 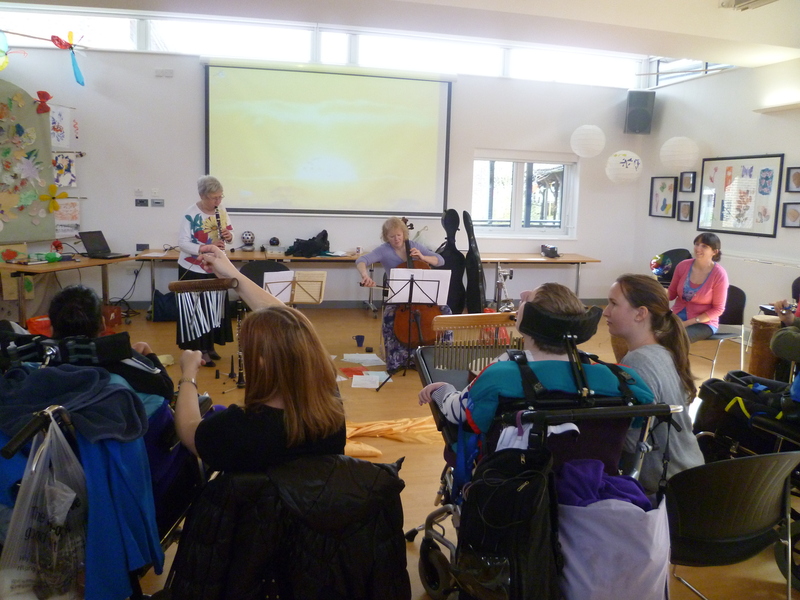 We were conscious that summer club should be fun and engaging, and we hoped that the chance to hear a harp and to feel its vibrations would be a thrilling experience for these wheelchair-bound children. We also wanted the support staff to have fun too, and the ratio of staff to children was mostly 1:1 so it was important that everyone was having a good time. Manoeuvring the wheelchairs really close to the harp was rather tricky, and we needed to be very careful not to damage the harp’s pedal box, but nearly every child was able to get close enough to be able to reach out with staff help and touch the pillar of the harp, feeling the strong vibrations flowing through as Alex played. One little girl, whose head we were told is nearly always down on her chest, lifted her head to gaze at Alex and his harp, and at the end of the workshop during our goodbye song she waved us her farewell. A favourite piece at each session was “Mists”, a dreamy and evocative piece for harp and clarinet that we elaborated with the sound of rainsticks, wind chimes and a thunder drum. First we explored the sounds that could be made with the percussion instruments, and then staff helped the children orchestrate the piece with imaginative, atmospheric sound effects. The opportunity to take part by adding additional percussion sounds and visual props to the music was noted by several members of staff as especially enjoyable for everyone, and by the end of each session we had added ‘seaweed’ (green plastic bag strips tied to coat hangers! ), a plastic diver, ocean drums, pebble bag scrunchers, sea shells in a bucket, frog guiros, seed pod rattles and castanets to the list of atmospheric additions to enhance a deep ocean-scape, a pirates’ hornpipe, and the song of boatmen heaving on their oars as they pulled a heavy cargo up the river. Finally we invited a free choice of percussion so that everyone could join in our final goodbye song playing their favourite instrument. As Alex and I were packing up our gear and gradually returning the school room to its former state, we reflected on how lucky we were to be able to play such lovely music, and to share it with these very special children who cannot share their thoughts in words but whose responses mean so much. Sarah Stuart and Margaret Archibald were at the Children’s Trust on Monday 23 February before the canteen opened for breakfast, so the bacon sandwiches had to wait! Both were keen to get the large percussion instruments in place for two full days of workshops enabling children and young people with profound and multiple learning difficulties to explore large orchestral percussion instruments. These workshops form part of a series supported by the Lucille Graham Trust and the Red Socks Charitable Trust, their generosity enabling us to visit four schools for children and young people with special needs. Our hello song had a Latin-American flavour, and Sarah kept the momentum going with a large guiro while I played a short riff on the clarinet as we skipped from one learner to the next, and then sang in harmony with Sarah as we greeted each learner in turn. 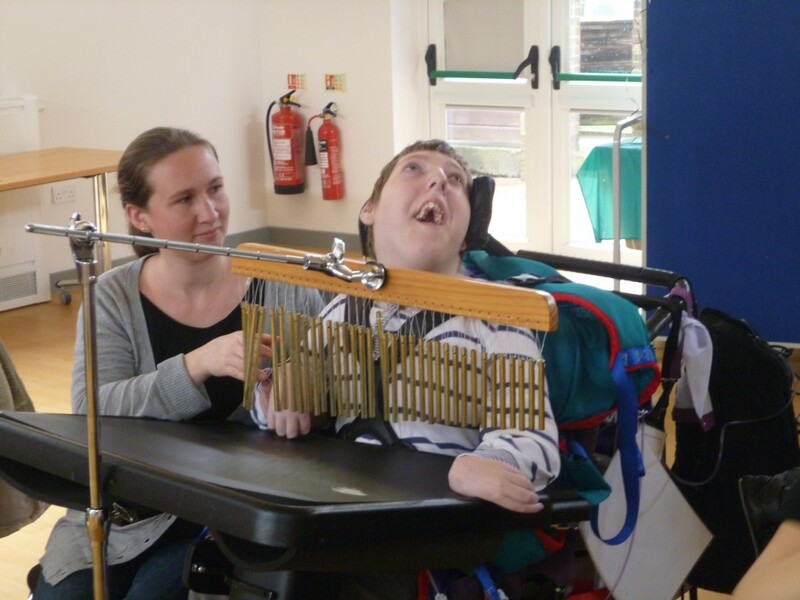 Sarah began her demonstration of percussion with the side drum, and we were able to involve learners and staff in joining our marching band with small percussion, and also with two suspended cymbals that hung comfortably just above the level of the tray on each learner’s wheelchair. 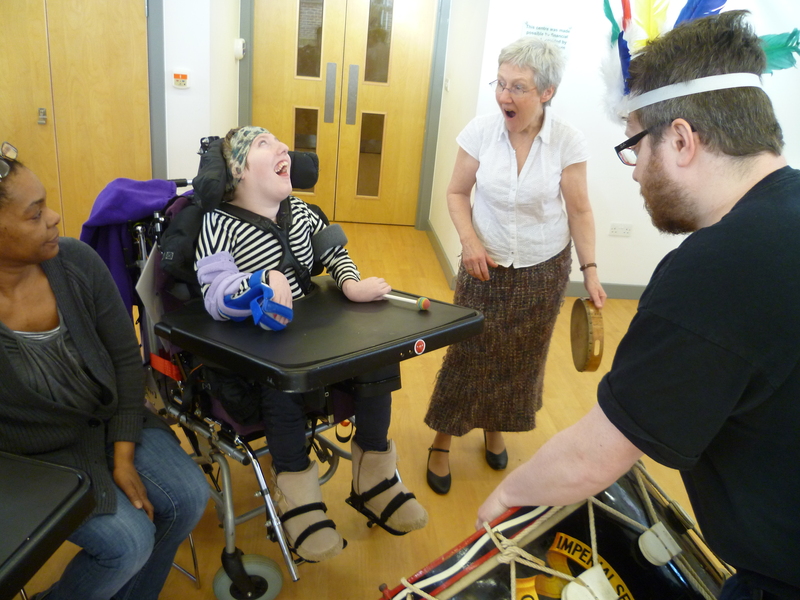 Claire and Tim, the resident Music Therapists, both commented that moving wheelchairs across the room in order to get really close to the tam-tam and the bass drum gave learners the cue that something new was about to happen. The muffled thunder resonances of these very large instruments created a palpable change to a darker mood, and when our next item came it was a relief to imagine ourselves jumping on a sleigh with everyone playing bells to accompany the clarinet and xylophone in a musical ride across the Siberian snow. Having encountered the xylophone the learners were invited to relax and simply listen to a piece featuring the xylophone and clarinet, and then it was time to take part again in “team timps”, with groups of learners in their chairs clustering round each kettle drum to share in creating an exciting and festive noise. We rounded the session off with a return to our Latin-American song, this time to say goodbye, with everyone playing a favourite percussion instrument. One of our aims was to create a sense of rehearsal leading to performance.We wanted to establish this pattern early in each session and develop it with each successive repertoire item. There was a trade-off between allocating time to allow individuals to explore instruments, and covering the full range of musical items to give variety. At our first Monday session, perhaps because everyone was fresh, and with a smaller group of just four learners present, we covered all the items. Later in the day, especially with slightly larger groups, we found we were making choices between items, lingering more on items where learners were taking turns to play large instruments such as the tam-tam and the bass drum. By the Tuesday we found that a pattern had begun to establish itself whereby we spent a lot of time early in the session exploring sounds, and then gathered momentum towards a climax with everyone playing the timpani together. The hypnotic effect of soft sounds on the tam-tam and bass drum, separately and together, seemed to capture many of the learners, and several showed especial pleasure on hearing the clarinet tones set against the deeper rumble of these very large instruments. Nearly everyone experienced the physical sensation of the tam-tam or bass drum vibrations, either by touching with hands, or through beaters, or from close proximity to the source of the sound through careful positioning of wheelchairs. We were told that this experiencing of vibration tied in with other resonance work that the learners undertake in school. Wherever possible we created ensemble effects, and at the last session on Monday we discovered that we could effectively cluster groups of learners around each kettle drum, creating a very effective Indian War Dance with everyone drumming together. This was such an exciting sound that we developed this at almost every session on the Tuesday, and one of our morning sessions on Tuesday finished with especially rousing versions of La Réjouissance and the Indian War Dance, the kettle drums giving so much pleasure to staff and learners alike that we continued to use them for the ensuing Goodbye Song. The Music Therapists told us that the learners are not used to music sessions that last as long as a full hour, but that on this occasion it was good for them to have time for a wide range of activities. The lunch-time session on the Monday was spent playing folk fiddle music to a large group in the hall, with maximum participation from hand percussion led by the two Music Therapists Claire and Tim who were both able to give their lunch-hour to share this time with everyone. The lunch-time therapy session on the Tuesday was also devoted to folk fiddle and clarinet; we worked in a therapy room with a smaller group of learners who were mostly lying down, some on resonance boards, and for these learners staff were energetic in drumming rhythms on the boards to match the tempo of each new jig or reel. The school has an open door policy for parents to share time with the children, and it was delightful that one of the younger boys was able to share his session on the Tuesday afternoon with both his parents who took great delight in the chance to play the wide range of instruments. It was lovely to see how much their mood was lifted by sharing in the fun. Sarah and I were impressed throughout by the willingness of all the staff to engage with each activity; staff help was invaluable in enabling each individual learner to access the different instruments and the different playing techniques to best advantage. We realised that it was important for us as the visiting musicians to make it clear to staff that we really did want them to take part in the music-making in their own right, and not just as support for the learners, as we wanted them to enjoy themselves too. In this way everyone in the room was contributing to the music, lifting the mood and giving greater energy to the results. Rutherford School, under the umbrella of the Garwood Foundation, caters for children with profound and multiple learning difficulties. Sarah Stuart and I visited on three separate occasions in late January and in early February. At our preliminary visit we spent a morning popping into the children’s classrooms; we were able to hop around the building easily with Sarah on folk fiddle and me on my little C clarinet, and we were helped by Music Therapist Sarah Kong to carry several bagfuls of small handheld percussion for the children to play. We performed a varied selection of folk tunes from England, Ireland and the USA, and staff and children together joined with each on different styles of percussion to suit the mood and tempo. It was lovely for me to meet the children again, many of whom were familiar from previous workshops at the school including most recently in 2013 with percussionist Scott Bywater working alongside Music Therapist Stephen Haylett who spends every Friday at the school and who has become our own Everyone Matters Music Therapy Advisor. For Sarah Stuart this was her first encounter with the children and she showed herself both sensitive to their needs and very encouraging in enabling their participation. Sarah’s ability to come alongside the children was increasingly in evidence as we progressed through our two full days of percussion workshops during the first two Wednesdays in February. Sarah arrived early for these in order to have time to unload her van that was stuffed with large and exciting orchestral percussion instruments. She brought a full-size chromatic xylophone, two kettle drums, a bass drum, a tam-tam, a side drum, suspended cymbals and, perhaps smallest but by no means least effective, a set of sleigh bells. Our programme was devised to give each group of children an experience of a wide range of tones and timbres of percussion, with maximum opportunity for participation, and wherever possible giving children experience of playing the large orchestral instruments themselves. The smaller instruments could be placed on a lap or a wheelchair tray, held by a teacher, or strapped to a wrist or an ankle to make each new type of percussion as accessible as possible; with the big instruments we found ways to turn the wheelchairs, change the angle of stands, or hold sounding surfaces close to feet or hands. For many of these children access is a constant issue requiring creative solutions to enable them to enjoy experimenting with the sounds on offer; they may find gripping a beater impossible, or they may suffer a degree of visual impairment. Our aim with each new piece of music was to lead the children through changes of mood, pace and style, encouraging different responses and eliciting varying degrees of motor control in order to produce appropriate sounds to match the music’s dynamics, tempo and character. One real highlight came on our last day when one teenage boy took full advantage of a short extra lunchtime session that Sarah offered for him alone. We were able to manoeuvre his wheelchair so that his knees fitted neatly under the xylophone and for the next ten minutes he experimented with striking at the wooden bars, stroking a glissando with the soft end of the beater, then switching to a glissando with the hard end of the beater, adding strokes on a suspended cymbal, returning to the xylophone, realising that it was not so effective played with feet, and then finally adding side drum that he played alternately with a beater and with his hand. It was thrilling for us musicians, and for the school staff who knew him well, to see how much he was able to choose to experiment with different types of stroke to access different types of sound, truly a revelation for us and clearly a source of enormous delight to him. These sessions were made possible by generous financial support from the Lucille Graham and Red Socks Charitable Trusts and with a slab of funding from the school. We were happy that the headteacher was able to join our sleighbell group for a rendition of Troika, played on clarinet and xylophone with a posse of bells jingling away from everyone else in the room, children and staff alike. 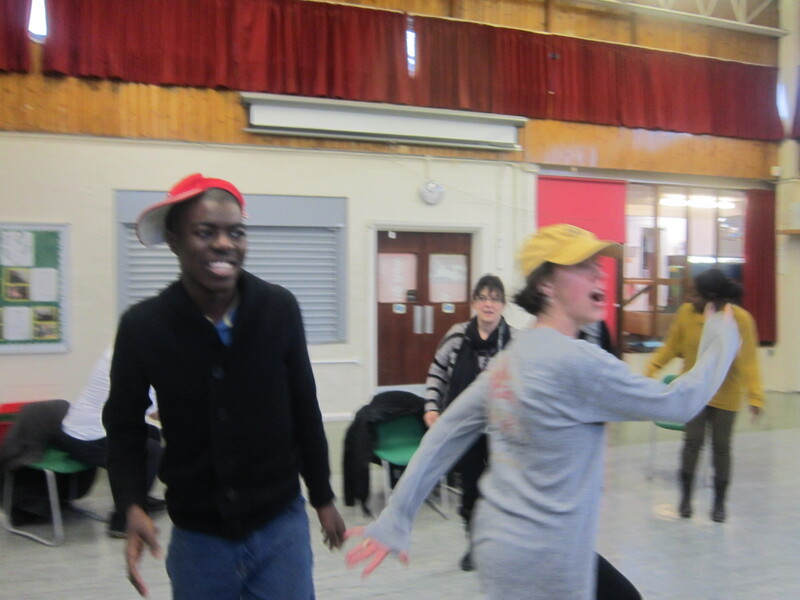 A post-16 student launches into a spontaneous Cossack move during an Everyone Matters dance workshop at Priory School in South Norwood. to be called “Changing Times”, it is to be a musical exploration of changing moods, styles, rhythms and tempi, and will celebrate the school’s move this term to a brand new building. Everyone Matters is passionate about bringing music to people who can’t get out to hear it or to play it themselves. We visit nursing homes, schools for children with special needs, day centres, etc. We have projects especially devised for groups of all ages, including tots under 5 and people diagnosed with dementia. Our professional musicians are committed to sharing great music with every group they visit. They turn up with anything from a ‘cello and a clarinet, to a van load of exciting large percussion. Young violinists, who performed alongside our professionals, see the funny side in post-concert chat with older people at Day Opportunities Chislehurst, Age UK Bromley and Greenwich. 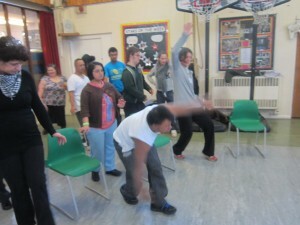 This intergenerational project was funded by the National Lottery through the Big Lottery Fund. 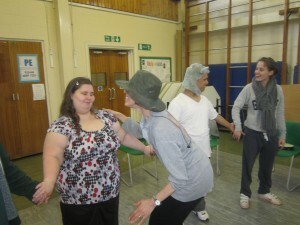 Choreographer Lauren Potter leads a circle dance with students aged 16+ at Priory School for young people with severe learning difficulties and on the autistic spectrum. “Big Chief” Scott, having just performed “Red Indian War Dance”, supports the weight of his antique bass drum to give this learner a close encounter with its powerful “boom”. 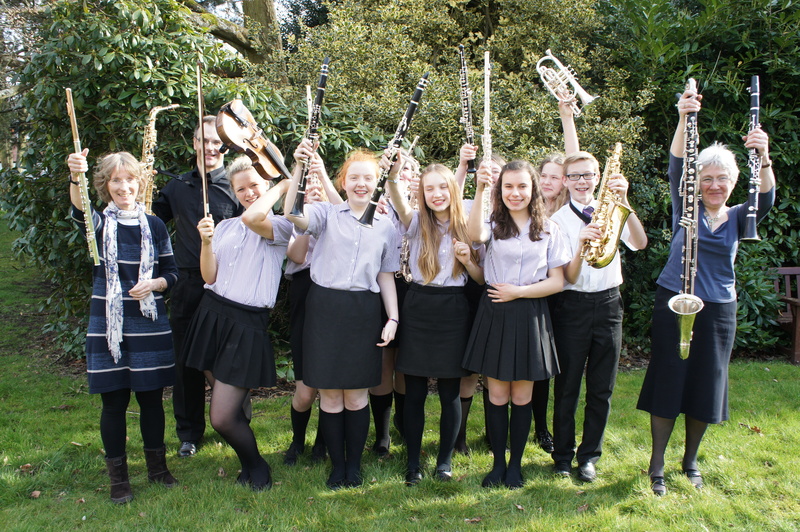 Young musicians from Bishop Justus School celebrate their success as performers alongside professional musicians in Bromley nursing homes. I hope you enjoy our new blog, and I look forward to keeping in touch! Please let me know your thoughts and ideas for our music making! Our links with Priory School started in 2012 when teacher Monika McIvor invited Everyone Matters to provide a short performance for the Post-16 Centre during Arts Week. In response Julia and I tucked an extra concert into our “Mood Music” project that we had already devised for presentation at three other schools, and the Priory students, young people with severe learning difficulties and on the autistic spectrum, wholly engaged with the music that we played. In particular they had fun dressing up in tails for conducting and in silly hats for our Rondo game and enjoyed participating alongside us using percussion, interactive features that inspired Monika to request a full project from us this year in which students could access elements of movement and costume. We decided to collaborate in a dance project and invited Lauren Potter to lead it. Choreographer Lauren Potter (in the brown hat) has a background in contemporary dance; she was a member of London Contemporary Dance Theatre for many years and was a founder member of Siobhan Davies Dance. Her response to the three groups of students whom we met at Priory School was truly inspirational; she was always ready to change emphasis to catch the mood of the moment, constantly moving around the group in order to engage individual students in a way that would be accessible to them, and yet maintaining the momentum of the session so that we easily covered the full range of activities, flowing effortlessly from one style and mood to the next. Props such as long lengths of vibrantly coloured silks, dyed feathers, percussion instruments and a huge crate of hats, resources that Julia, Lauren and I had all pooled in advance, gave the different activities an added focus, and Monika McIvor, the teacher at the school with whom the workshops had been set up, identified the use of props as one of the features that particularly engaged the students. We were struck by the freedom with which these young people moved, responding to the varied programme of music, some fast, some slow, some sad, some exhilarating, that we chose for our dance sequence. When Julia and I started playing an Allegro by Stravinsky one young man immediately leapt from his place in the circle of chairs to take centre stage with a spontaneous Cossack dance. It was good to know that our workshops were building on a regular programme at school called “Step into Dance” and we were especially delighted that the teachers and teaching assistants were happy to join in the activities alongside the students, enabling them where necessary and also simply sharing the fun. The semi-circle of chairs [was] an anchor point for the students, so they could return to the ‘safety’ of their seat as each ‘event’ unfolded then concluded. One Teaching Assistant made a comment about one of our students that she hasn’t seen him move so much in years! At the end of the session some students were asking me if they were going to do it again. The students have enjoyed it so much! A project led by choreographer Lauren Potter. Live music played by Julia Desbruslais, ‘cello and Margaret Archibald, clarinet. Supported by the Lucille Graham Trust and the Red Socks Charitable Trust, with contributions from the schools. Since Christmas Scott Bywater and I have had the privilege of delivering workshops at three schools for children with profound and multiple learning difficulties. In January and February we visited Rutherford School in South Croydon and the Surrey Teaching Centre at the Children’s Trust in Tadworth. Then, in March, we returned to Tadworth for a further two days at the School for Profound Education. Staff, pupils and parents were moved and uplifted by your sessions and we had so many positive comments. We were so touched at the effort you put in bringing so many instruments and building in responses from one week to the next, not to mention your totally thorough planning and evaluations. Scott and I had first devised our percussion project at the behest of Stephen Haylett, Music Therapist at Rutherford School. 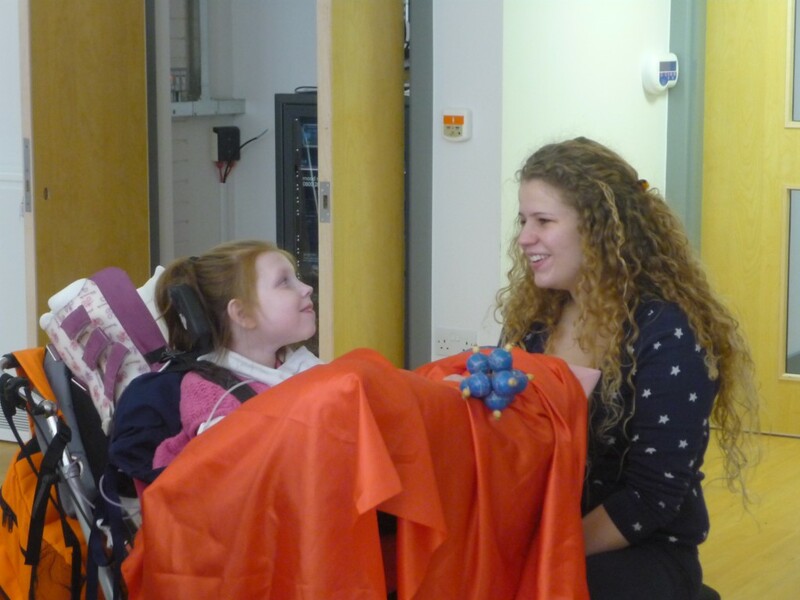 Most of the children at Rutherford have no access to spoken language, suffer some degree of visual impairment and are nearly all wheelchair users, and Stephen had suggested that we could engage them initially by appealing to their sense of touch. Our starting point in devising the project was that we would explore different textures for their sound-making potential, show ways that staff and children together could create simple percussion instruments in class, and then use the children’s own shakers and drums in our hands-on music-making sessions. It was delightful to see the range of instruments, mostly shakers, that resulted from this, including some that were beautifully decorated with beads or paper butterflies, and even two water bottles that had become a tiger and a leopard, complete with eyes and a tail! However, it has to be said that in the end it was the quality of Scott’s many large and exciting orchestral percussion instruments that carried the sessions, and the compelling power of some great music, chosen from classical and modern repertoire, including such percussion-rich warhorses as Ravel’s Bolero and Bizet’s March of the Toreadors. Throughout our days at all three schools the greatest thrills were from experiencing the wonderful range of percussion instruments that Scott piled into his van for each visit. We had always planned to make a big feature of the vibraphone, and the tremulous magic of its unique sound did indeed fascinate many of the children. Some were able to see the vibraphone’s fluttering mechanism and one young lady accepted her own pair of beaters and joined Scott to play Twinkle, twinkle; others were able to join in by playing gentle chimes or bells that matched the mood of gentle pieces, including Chick Corea’s “Crystal Silence” that allowed each session a moment of repose. Progression from one visit to the next was difficult to guage at Rutherford School, but Stephen Haylett commented on the greater confidence that grew as children became familiar with us and the sounds we were making. It was especially exciting to see one pupil’s response to Scott’s bass drum; this is a boy who usually enjoys his music sessions, and on both our visits Scott was able to take direction from his increasingly excited gestures, mostly indicating “faster” or “louder” – the school staff said they had not seen him so animated for a long while! I felt that the activities in which the responses of the children dictated the style, pace and direction of the music were most effective. For instance, some of the groups seem to prefer a softer, more reflective style of music-making, using bells and chimes as the predominant musical texture. 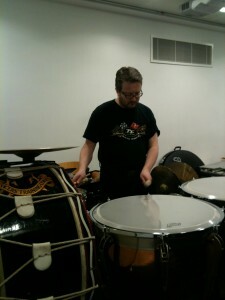 Other groups revelled in boisterous and extrovert playing, especially when featuring cymbals, bass drums and timpani. There were some wonderful examples of musical interaction between Scott and the children, enabling some of them to experience at close hand the vibrational and distinctive sounds of the larger percussion instruments. I was glad to be able to play melodies on my clarinet to suit the wide range of percussion sounds that Scott made available, but perhaps the most moving moment for me was to watch Scott working with the two boys at the Surrey Teaching Centre who had suffered tragic brain injury in accidents, helping each in turn to hold a stick and strike the kettle drum, and then wait for each one to initiate the next stroke with the tiniest flicker of a sign that this was what they each wanted to do. We can’t thank you enough… come back again. All our good wishes,I hope you continue to have fun with many more pupils, children, students, parents and staff for many years to come.